Glucuronolactone, Theacrine (TeaCrine®), Ashwagandha (Root) Extract (Withania somnifera) (KSM-66®), Cordyceps (Cordyceps sinensis), L-Tyrosine, Holy Basil (leaf) (Ocimum tenuiflorum) Extract, Reishi Mushroom (Ganoderma lucidum) Extract. Waxy Maize, Natural And Artificial Flavor, Maltodextrin, Silica, Sucralose, Acesulfame Potassium, Calcium Carbonate, FD&C Blue 1. KEEP OUT OF REACH OF CHILDREN. Not intended for individuals under the age of 18 or individuals sensitive to caffeine unless instructed by a doctor. Do not use this product if you are pregnant or nursing. Consult a physician or healthcare professional before using this or any other dietary supplement or before beginning an exercise program. Consult with your primary physician prior to use if you have any pre-existing medical conditions, or if you are using MAO inhibitors or taking any prescription or over-the-counter drug(s). Discontinue use and consult a medical doctor if you experience any unusual symptoms. If you or your doctor has any questions about this product, please call 1-866-688-7679. One serving (one scoop) of this product contains up to as much caffeine as two strong cups of coffee. Do not combine with other caffeine sources, and do not exceed recommended serving. The contents of this formula may cause a blood-flow "flush" and/or a tingling sensation in the extremities of the body (e.g., fingers, ears, toes, etc.). This is normal, and you should not be alarmed. The "flush" and sensation should subside after one to two weeks of continuous use. WARNING for California residents only: This product contains substances known to the state of California to cause cancer, birth defects, and other reproductive harm. Use only as directed. Do not use if packaging has been tampered with. STORE IN A COOL, DRY PLACE. AVOID EXCESSIVE HEAT. Waxy Maize, Natural And Artificial Flavor, Maltodextrin, Silica, Sucralose, Acesulfame Potassium, Calcium Carbonate, FD&C Yellow #6. 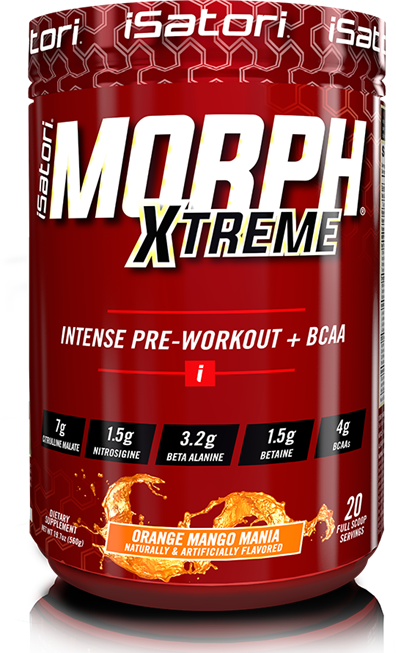 Sep 28, 2017 iSatori Morph Xtreme Brings Energy & PUMPS to iSatori Pre Workouts! Forget the trickery behind 2, 3, 4 and even 6 scoop formulas and harness the power of everything you need in one perfect scoop! 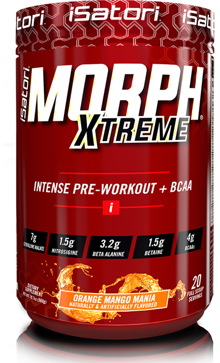 MORPH XTREME: MORPH Your Training, MORPH Your Results! In unison with the above ingredients are 21 other powerful synergistic ingredients to push your workouts to the next level. "My career depends on a great workout day in and day out. I leave nothing to chance when I I go to the gym, and a pre-workout is essential to me. I’ve used iSatori pre-workout supplements for the past few years, but I have to say this is THE best one ever. It's the best workout partner I can have. Amazing energy and strength and the BCAAs are essential for immediate recovery. I love the BOMBSICLE, and for me 3/4 of a scoop is perfect."